There’s no denying the effectiveness of Keanu Reaves’ latest star vehicle, writes ANDREW JOHNSTONE of the sequel to the John Wick noir thriller. The Searchers (1956), The Virgin Spring (1960), Point Blank (1969), Dirty Harry (1971), Get Carter (1971), Old Boy (2003) Kill Bill Vol. One and Kill Bill Vol. Two (2003-4), Dead Man’s Shoes (2004) and Taken (2008) are a certain kind of revenge film, portraits of the obsessed on a rampage for justice. There is a new player in town and he is good. His name is John Wick. How do you explain Keanu Reeves, an actor of middling range who has managed an enduring A-List film career? Well, he does have a certain kind of charm and he was lucky early on (Bill And Ted’s Excellent Adventure) but he has also chosen some good films, one of which turned into one of the most influential film franchises of all time, The Matrix. He is obviously a player. You don’t make it to the top without having a decent set of smarts, and besides, audiences love him. Among the numerous howlers that dot his catalogue, 2013’s big budget remake of beloved Japanese classic 47 Ronin stands out. A pet project, it failed with audiences, was panned by critics and dropped a tonne of money, but it’s what happens next that is remarkable: in a blink Reeves bounces out of a train wreck and into a lucrative new franchise. John Wick (2014) is a low budget noir thriller centred on a retired hit man mourning the death of his wife. One night some hoods at a gas station take a liking to his car and later when he is not looking, take him down, steal the car and kill his dog. His late beloved wife gave him that car and he means to get it back, along with some satisfaction for the dog. The son of a local mobster is involved, and while he has no idea what he has done, his father does. The son is unconvinced. Silly boy. John Wick’s universe is a carefully arranged underworld populated by thieves and hitmen who live by an honour code centred on the Continental Hotel, a vaguely Bond style criminal lair maintained by Winston (Ian McShane of Deadwood and American Gods). The rules of conduct are complex but Wick knows his stuff and skilfully navigates this underworld maze in his quest to make things right. It’s all very shiny and slick and the tightly choreographed fight scenes and shoot-outs are among the best of the last several years. An explosive hit, the film made a truckload of money off a paltry $20 million outlay. Given all that, John Wick 2 was inevitable. It begins where the first one left off and job done, Wick heads home to rest a hand on his new dog’s head while staring hard at photos of his dead wife. But before he can settle down on the sofa for a well-earned rest, obligation in the form of a Mob Boss comes a-knocking, and after a little ‘persuasion’, Wick reluctantly agrees to one more job. It could have been real simple but the mobster decides to kill Wick as well, and fails. “You have no idea what’s coming,” says Winston to Santino D’Antonio, the mob boss in question, over drinks at The Continental. To be fair, he thinks he does but Winston is right, he doesn’t and all hell is set to break loose as Wick works himself up into rampage mode. And what a fine rampage it turns out to be. The best of it is set in an Art Gallery amidst an exhibition devoted to the concept of infinity. The Director sets all kinds of metaphors to work here as well as paying fair tribute to that doyen of cinematic tricks, the mirror maze. The scene where Wick hunts down D’Antonio through a shifting maze of mirrors is lifted straight out of Orson Welles’ classic 1947 noir thriller The Lady From Shanghai. Of the other references at work is director John Boorman’s magnificent 1967 neo-noir thriller Point Blank. Walker (Lee Marvin) just wants the $93K he is owed from a heist that went badly wrong and is in relentless pursuit of both the money and the duplicitous associates that stole it from him. Lee Marvin’s Walker might just be Keanu Reeve’s John Wick template. Oh, then there’s Bullitt, Steve McQueen’s classic 1968 thriller most famous for its car chase set pieces. 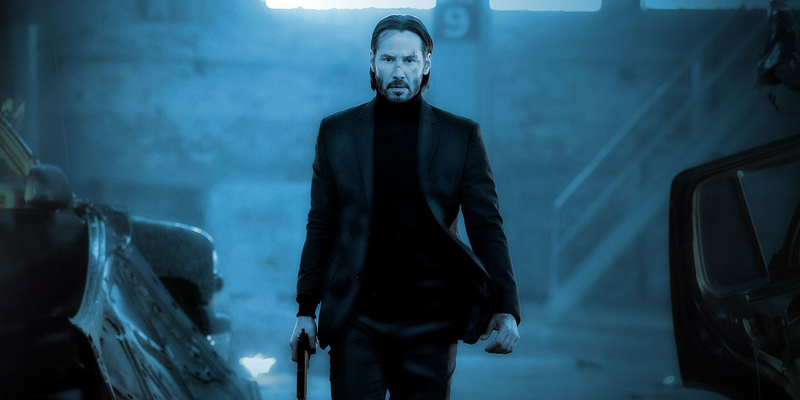 The cars, the attitude and the mayhem – it’s all there in John Wick 1 and 2, and this is not a bad thing at all. 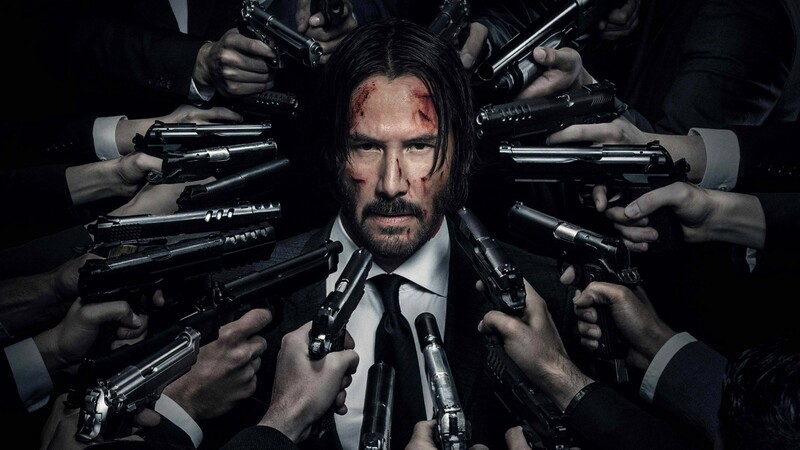 As smoothly polished as a Bond production, John Wick is a marvelous creation and Reaves moves perfectly within a largely undemanding persona requiring three moves: grimacing, glowering and attacking. The first movie was a bolt out of the blue but 2, running exactly to formula, starts to drag a bit by the last couple of scenes. But hey, a minor quibble. After all, it’s made so much money that hell’s bells, you know there’s going to be a 3. It’s a good idea but it is going to need something new added to the mix next time round if it is going to endure. Looking forward to seeing what they come up with. * Available via on-demand, DVD and Blu-ray.